This photograph depicts an aerial view of St. Albert and the east end of Big Lake, taken by Victor Post. The board on the back of the photo reads "Presented to BLESS, October 14, 2000. By Bob & Joanne Russell. Photo by Victor Post. Frame courtesy Apex Land Corporation." A plaque on the frame reads "Big Lake. Photo by Victor Post. Donated to BLESS by Bob & Joanne Russell." A note taped to the front of the box the photo was donated in reads "2013 Jan 17, Thurs. S.R. [Loumis] notes. 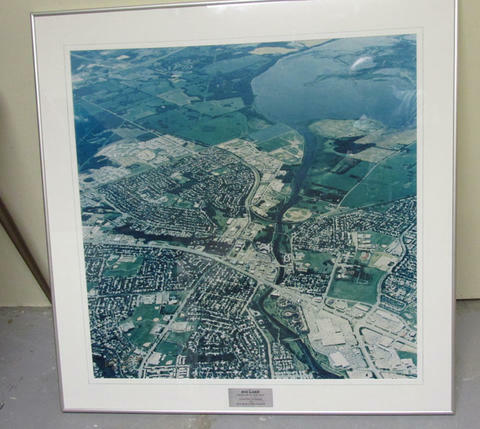 Re: This 'Post' (St. Albert photographer) took this aerial photo of the east end of Big Lake, 'circa'. 1998?? Bob Russell undertook to have it framed. Bob returned it to BLESS at the AGM @ the Rugby Club Jan. 17, 2013. THe photo should be on display publicly 'somewhere' appropriate but for the time being store at the log cabin for safe keeping." Donated by Dave Burkhart, 2016.